Chihuahua kisses can be very nice, unless your dog suffers from the heartbreak of halitosis. Then maybe not so nice. But most of the time this is a solvable problem. Chihuahuas are notorious for stinky breath. It isn’t the dog’s fault. The breed is prone to all sorts of dental problems, including plaque (which hardens into tartar), gingivitis (gum inflammation), and tooth decay and infection. There are also specific medical conditions that can exacerbate these tendencies. 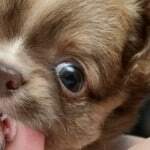 Chihuahua puppies may have especially bad breath during their teething process, which generally lasts from three to six months of age. Fortunately, this period passes; and luckily too, it offers a good opportunity to get you and your dog onto the track of good dental care habits. Consider what your dog eats. Everyone is agreed that when it comes to bad breath, dry kibble is better for your dog than moist food, because chewing the dry food helps scrape off plaque. But that doesn’t mean you have to forego moist food altogether, and in fact, for digestive purposes and to prevent constipation, it is good to offer a mix of both types. Watch what your dog eats when she thinks you’re not looking. Specifically, stuff on the ground, which seems irresistible to the dog but can cause problems far more serious than halitosis. And, if you have a household with felines, cat poop, which dogs consider a kind of candy. You may have to position the cat litter pan in a way that the dog can’t get at it. 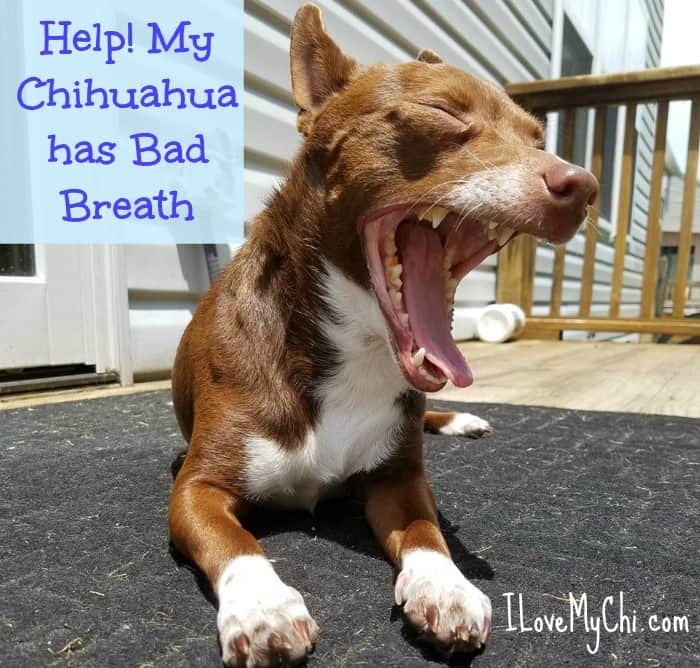 Make sure your chihuahua has plenty of great chew toys, especially ones that are marketed for breath issues. Greenies and Minties are great for helping with breath and teeth issues. I have been giving them to my Lucas for his stinky breath. I give him 1 treat every morning and after about a month, I noticed his breath smelled much better. I still give him this treat every morning and he loves them. His stinky breath smell hasn’t come back. You can get them off Amazon here. Add a few drops of unsweetened lemon juice to your dog’s drinking water. 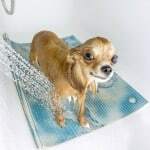 Try offering your chihuahua some parsley or peppermint leaves, which have a delightful effect on the breath, and also baby carrots, which help both the breath and the teeth and gums. 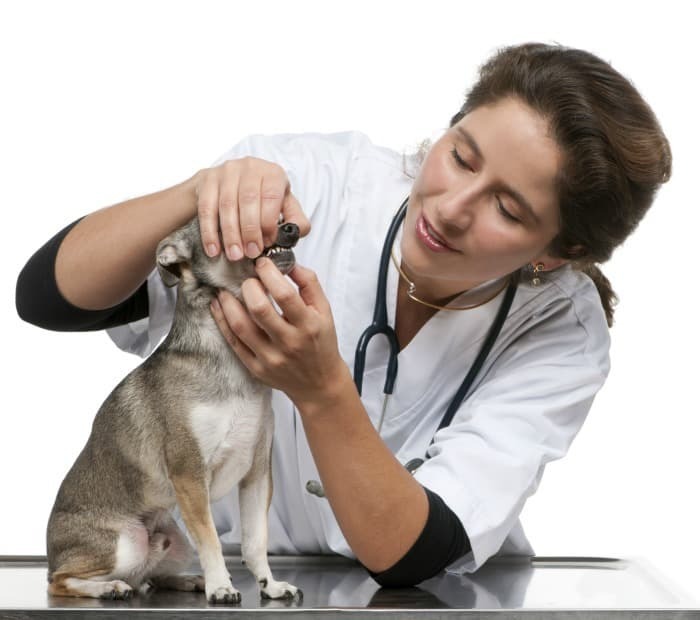 When you visit your veterinarian, he should always take a look at the dog’s mouth, and if he then recommends a professional cleaning, swallow hard and pay for it. If you notice a really foul smell, get your dog checked by a vet as soon as possible as it may be an infection. So is there anything I forgot? Anything you have found that helps with your dog’s stinky breath? Please do tell in the comments! Their teeth can get crowded in their little mouths, Matilda still has a baby tooth that needs to be extracted, food gets caught behind it. Daily brushing helps her the most, but it’s so tough when they enjoy it! Yep my Joey had a baby tooth that wouldn’t come out and it became impacted. His breath smelled horrible but once the vet took it out and he healed, his breath was fine. My Tammy-Sootu had baby canines that stayed behind after the rest of the baby teeth fell out. She looked a special brand of fierce with double-canines ! No bad breath yet but I have an elderly long-legged white Chihuahua that had breath that could stink the paint off the walls ! Her teeth were litterly rotten when we got her as a rescue. The only “fix” for her (named “Sidney”) was to have all of what was left of her teeth removed. After that was completed, little Sidney’s breath was springtime sweet ! And she stopped getting sick all the time. 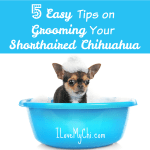 If your Chihuahuas’ teeth look stained, you should get them to a Vet and have their teeth cleaned. I have to do this because Tammy-Sootu and Martha will readily BITE the fool outta the closest body party that presents itself in an attempt to mess with her teeth! Sidney, my aged little white girl-dog, will also “bite” but with no teeth, it feels strange. Being “gummed” dosent hurt. LOL, yeah I would definitely rather be “gummed” than bitten. I have taken my Chi off all grains and sweet potatoe additives she is now having Salmon and sardine with chick peas still has bad breath she eats 11 plus cat food and her bad breath goes? But I read cat food no good for dogs can you advise on this. PS Not her teeth. My vet told me that cat food was higher in fat so dogs can gain too much weight on it. But if yours isn’t gaining weight and is doing well on it, I’d keep feeding that. Yes, do let us know Shawna.